Thank you for the email. I did receive my order in a timely manner and am very pleased. I'll definitely recommend you. 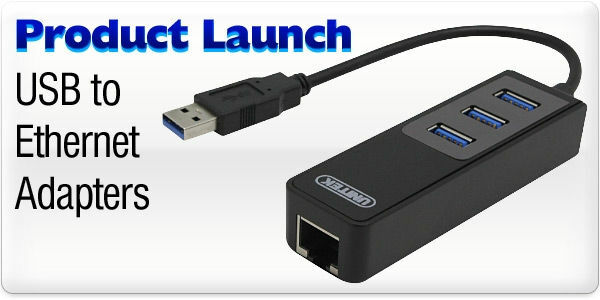 Super-Speed USB 3.0 Hub and Gigabit Speed Network Access all-in-one! Have you run out of USB ports on your new Microsoft Surface Tablet? Or bought a slim netbook that doesn't have a network socket? These are the common issues we face now that technology has gone on a diet. When we're faced with smaller form factors, slim cases and compact sizes, the first thing we miss is the versatility of the older generation. 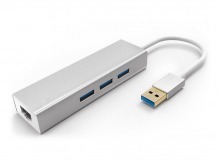 With this USB 3.0 Super-Speed compatible hub, you get the best of a fast 3-Port USB 3.0 Hub, plus a Gigabit USB to Ethernet Adapter in the one handy device. Enjoy blazing fast access to all your USB 3.0 portable hard drives and flash drives, plus access to all your older USB 2.0 accessories including printers, cameras and more. More than just a USB Hub, you also get a full size Ethernet port for Gigabit access to your router or modem via regular cat5 or cat6 RJ45 network cable. This allows you to skip the WiFi shenanigans and copy files across your network at full speed, even if you're rocking 1000Base-T hardware. Great for those pesky wireless connection errors, low speeds or annoying drop-outs. You can even use it as a second network card to access different networks simultaneously. This device is plug and play on most systems including Windows XP to Win 10. We have also included a driver download for Mac OS X. Please note: Because a single USB port on the computer/laptop is being used to access all connected peripherals, simultaneous use of high-load devices will reduce your overall data bandwidth for each device. For example: copying files from multiple attached hard drives or memory sticks will slow your transfer rate considerably. Likewise, simultaneous use of high-powered peripherals may reduce the available current. For example, charging multiple iPads at once will slow the charge rate on all devices. Answer: "Unfortunately not. The USB port on your printer is only able to understand storage devices (and possibly only one at a time), and won't have the drivers needed to operate the network adapter hardware." A potentially stupid question given it states that Mac OSX onwards is one of the system requirements, but does the gigabit network function work with Apple as well? I'm looking at using this with the new 2015 Apple Macbook. It will be connected through the USB c adapter into a USB 3 socket. Answer: "Yes, the Ethernet function of the hub is operable under OSX and above. The driver disc is not required - it works without any additional software. Not a stupid question at all, even the product box is vague on this point. We tested it ourselves and it was all good!" Answer: "This product does not require an external power supply. It runs entirely from the USB socket." Answer: "Yes. It has been tested under Windows 10. It didn't even need the driver disc for full gigabit network support. Very cool!" As usual, my order was processed really quickly and I received my cables in no time.....far less than one business day....well done Cable Chick!